Three new IPs appeared in 2000 that would certainly define aspects of gaming for the new century, Hitman, The Sims and Deus Ex. I regarded The Sims as pure nonsense even to this day, but can't argue against it's popularity nor disregard it's positive affect on PC gaming over the years. I eschewed Hitman as a series because I wouldn't want to spent that amount of time with what is essentially a bad guy. 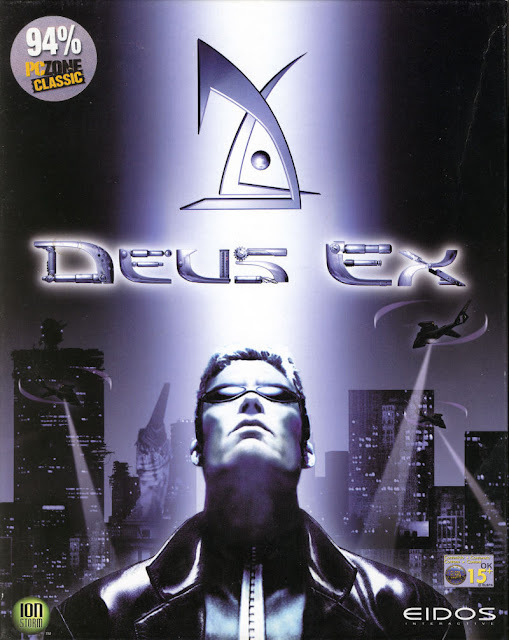 As for Deus Ex, well, while I loved The Matrix and conspiracy movies it was still a new IP but my gaming schedule was so full back then. In Summer 2000 alone, Soldier of Fortune had already arrived, Diablo II and Icewind Dale came out and both Star Trek: Elite Force and Baldur's Gate II: Shadows of Amn were released at the end of the summer to take us into the first Xmas of the new millennium. There just wasn't time. Deus Ex could have been the game I got at Xmas that year but instead I choose No One Lives Forever - a tongue-in-cheek 60's styled FPS that was as much Austin Powers as it was James Bond and arguably possibly one of the best female protagonists in gaming history. Today I lament the fact that due to Fox/WB rights issues it can't come to GOG or Steam. Despite Deux Ex being lauded as #1 or 2 game of the year, NOLF was so good I had no regrets. As 2001 was filled with just as many distractions like Aliens vs Predator 2, Return to Castle Wolfenstein, Baldur's Gate II: Throne of Bhaal and of course Max Payne, I all but forgot about Deus Ex. 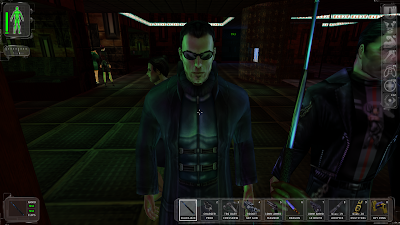 In 2003 the Deus Ex sequel Invisible War didn't come into my radar range as much as it's original and I recall the consensus was that it wasn't near as good. I recall however in 2005 I noticed that Deus Ex was still getting one of the top 5 spots in the greatest PC Games of all time lists no matter what the source. I thought maybe I should have played that after all, but made no move to do so. In 2010 the situation hadn't changed that drastically which still spoke volumes about its quality and as a third entry in the franchise, eight years since the last, was creating a lot of buzz I thought perhaps it was time to correct the Deus Ex oversight. It was still ANOTHER 5 years later before I added the Game of the Year edition to my Steam library in 2015. There it sat for more than two more years before I finally said "Deus Ex - let's do this!" When you boot up a 18 year old game, no matter how good the optimisation is on Steam or GOG it will run, but may not run the best it could and certainly not going to look very pretty. Initially I discovered the game was much too dark, I was having a significant frame rate drop when looking at water and boy were graphics that ugly in 2000! Thankfully due to the game's success, popularity and much beloved status, fans have programmed hundreds of fixes, add-ons and patches that improve the Deus Ex experience exponentially for modern gamers. The ones I used to give me the best solution were a new Direct3D 10 Unreal Renderer, high resolution textures and a new launcher with which to configure parameters for the game that wouldn't have even been dreamed about 18 years ago such as making the GUI big enough to prevent eye strain at 4K resolution with which I enjoyed the entire game with with no issue. Normally to stand playing something so old there would need to be a wistful sense of nostalgia involved commonly from having played the game back when it was modern and if nothing has replaced it in the intervening years and I'll cite the X-Wing franchise and Duke Nukem as examples (I chose to ignore Duke Nukem 4Ever). In Deus Ex's case there is no familiarity as I never played it before and it's mechanics with RPG elements are so out of place from a game of that era I found myself both unprepared and marvelling at the game which I can wholeheartedly agree was way ahead of its time. 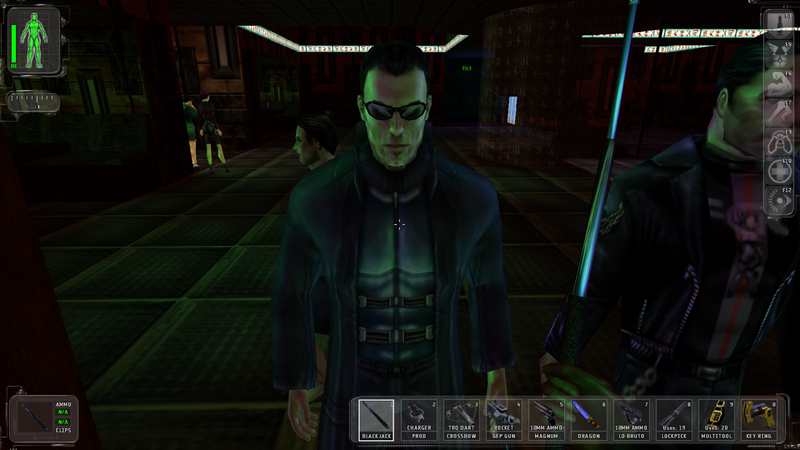 The RPG elements which slowly found their way into more modern shooters may have been touched on by earlier games than Deus Ex but there was enough here to call Deus Ex an FPS/lite-RPG. Customising your character with different augmented abilities and specifying skills were astonishing. The weapon upgrade mechanic was something I thought was originally Crysis' bag, but J.C. Denton was doing it in Deus Ex several years earlier. The multiple physical approaches (sometimes more than two or three) as well as style (stealth, tech, guns blazing) to the objectives in each mission comprised of multiple and optional goals were features that I now see were directly responsible for the game's longevity and valid reasoning for support for many play-throughs, none of which were likely to be identical unlike so many other examples of the genre. The game is hard - managing an inventory of only a few spaces when you had so many great options for equipment and weapons made decisions to drop and select things very hard - you want to carry everything unrealistically like other games. Unlike most video-game heroes you're not carrying a quarter of a million rounds of ammunition around with you, you need to improvise, adapt and overcome which was undoubtedly developer Warren Spector's goal as well as weaving a carefully crafted narrative with characters that adapt to many of your decisions. Deus Ex is also a product of a time when FPS games were far longer in length, taking me 34 hours to complete and I'm glad to say that I have. Pros: More than just a mindless shooter, Interesting RPG elements and multiple paths were ahead of it's time. Cons: Needs some finnicking with third party software at installation to get it working properly, it won't run best out of the box anymore. Available at Steam for €6.99 but wait for frequent sale when it's about €2.75 or less.